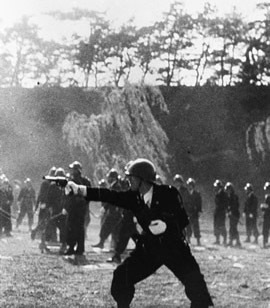 A policeman firing a pistol at demonstrators during the 1952 Bloody May Day demonstration. Every year on May 1, Japanese labor unions and political parties of the left hold big demonstrations that also serve as opportunities for political protest. The 1952 demonstrations in the public plaza in front of the Imperial Palace in Tokyo were the first after the San Francisco Peace Treaty had been signed. Demonstrators opposed to the treaty terms entered the Imperial Palace grounds, which were off-limits, and clashed with police. A bloody battle ensued, in which police used teargas and fired pistols at the unarmed demonstrators, causing many deaths and injuries. This was the first time in postwar Japan that police had used lethal force against demonstrators, who were exercising a constitutionally protected form of political expression. Afterwards there were changes in police procedures for managing demonstrations. Police no longer carried guns when patrolling demonstrations, and teargas was not used again at demonstrations until the Anti-Security Treaty demonstrations in 1960. Click on PICTURES, below, to see how teargas was used at the 1952 Bloody May Day demonstration.